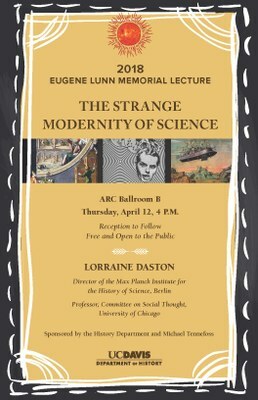 This year’s Lunn Lecturer will be Lorraine Daston, Director of the Max Planck Institute for the History of Science, and Professor, Committee on Social Thought, at the University of Chicago. "Like earthquakes, transformations come in all sizes, from the barely detectable tremor to the upheaval that changes everything suddenly and irreversibly. At latest by the mid-twentieth century, modernization became the Big Bang of all transformations, and models of transformation fixated on that seismic moment. The discipline of the history of science owes its very existence to this view of European modernization as the first and most momentous episode in the Big Bang transformation. And almost every theory of modernization advanced in other disciplines -- sociology, economics, political theory -- includes the Scientific Revolution of early modern Europe as an important component and even motor of modernity. But how, exactly? What exactly is the model of transformation that supports the alleged centrality of science in modernity? My aim in this lecture is to explain how and when this narrative about the Scientific Revolution and modernity emerged in the early twentieth century – and why it won't die, despite the best efforts of the best scholars to bury it with a stake through its heart."